Israel says it is "deeply disappointed" by the United States’ readiness to work with the new PA unity government. Israel said on Monday it was "deeply disappointed" by the United States’ readiness to work with a new Palestinian Authority (PA) unity government. "We are deeply disappointed by the comments of the (U.S.) State Department regarding working with the Palestinian unity government," a government official told AFP. "This Palestinian government is a government backed by Hamas, which is a terror organization committed to Israel's destruction," the official, who declined to be named, pointed out. "If the U.S. administration wants to advance peace, it should be calling on (PA Chairman Mahmoud) Abbas to end his pact with Hamas and return to peace talks with Israel," the official said. "Instead, it is enabling Abbas to believe that it is acceptable to form a government with a terrorist organization." The remarks come in response to a statement earlier by State Department spokeswoman Jen Psaki, who said Washington believes Abbas has "formed an interim technocratic government... that does not include members affiliated with Hamas." "With what we know now, we will work with this government," Psaki said. 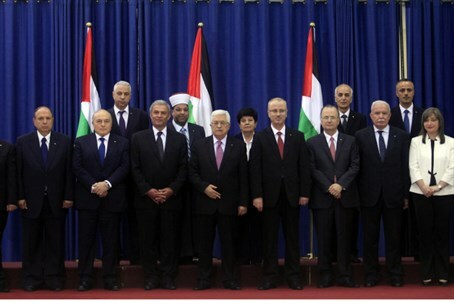 The new PA unity government was sworn in on Monday in Ramallah, the first such unity government for seven years. "Today, with the formation of a national consensus government, we announce the end of a Palestinian division that has greatly damaged our national case," Abbas said. "This black page in history has been turned forever," he said in remarks echoed by the outgoing Hamas government in Gaza. "We hail the national consensus government, which represents all the Palestinian people," Hamas spokesman Sami Abu Zuhri told AFP. The Israeli Cabinet subsequently decided not to engage politically with the new government, as part of the policy not to negotiate with terrorists.